* Songwriting Workshops may not be audited. Song Studios are FREE to observe! What is a Song Studio class? Song Studio is an opportunity for our community to come together through singing and provide a supportive environment to practice performing. After a period of group singing and warm-up, this class focuses on individual performances from students. Are you ready to make your song come alive? Sing with YOUR voice and create a captivating, engaging performance. If you’re gonna sing a great song, you’ve gotta be impeccable with your pitches and rhythms. Get clear on the notes, the timing, and the phrasing of your song. Use your voice to its maximum potential. Learn to sing with a powerful, clear, and comfortable sound. We will work on breath, posture, and tone quality to help you sing your song with with a beautiful voice. Every genre has its own DO’s and DON’Ts. Become a pro at performing well in your genre of music while making it your own and singing with your own voice. Time to communicate! What are you saying, and how are you going to say it? Once you’re onstage, you are the storyteller, and you get to take your audience on a journey. 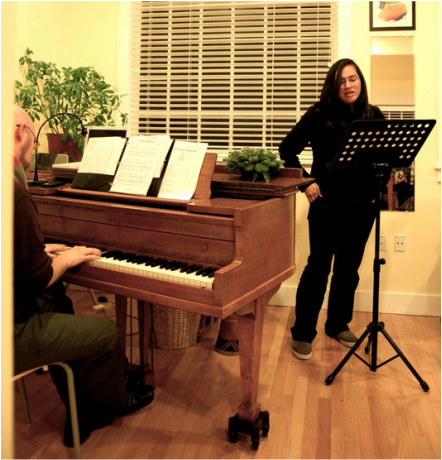 "After a long, stress filled day at work, I dragged myself into the Song Studio class. I literally walked out recharged, joyful and smiling from ear to ear! Everyone in the class, and especially Daniel Buchanan, the instructor, made me feel welcomed. Every person in the class was filled with joy and authentically supportive of one another! The class began with light stretching and vocal warm ups. Then each member had an opportunity to perform a solo or duo for the group. It was inspiring to see such passion and delight emanating from every student and even from Daniel. Honestly, I expected the class to be intimidating, but it was far from that. It was warm, heartwarming, and again, deeply inspiring! I even got teary eyed by some of the performances; the singing was that touching. I also learned some excellent tips on how to improve your posture and sustain your voice while public speaking or singing. I never knew that singing could bring so much joy!" "Another fantastic Song Studio class last night! So wonderful to hear my fellow students/performers share their authentic selves. Thanks to each of you for the support and encouragement, and thanks to Daniel Buchanan for being an amazing teacher and creating an environment of catharsis and community." Pick a song and be prepared to sing it in class. The song can be from any genre of music, such as pop, rock, jazz, classical, musical theater, folk, indie, R&B, etc. Learn the song well before you attend the class. You should learn the notes and lyrics to the best of your ability. Even better is for the song to be memorized. If you need help learning your song, schedule a private lesson at Resound NW before attending this class. Have a plan for accompaniment. A professional pianist will be provided in class who can play for you with appropriate sheet music. You may also accompany yourself on piano, guitar, or another instrument. The last option is to sing with a karaoke track, which you should bring with you on an mp3 player or CD. Bring the sheet music for the song. If it is available, you should bring full sheet music, which includes the vocal line and the piano part. If this sheet music is not available, you may bring a lead sheet, which has the notes for the melody line and the chord symbols for the pianist to play. Please do not bring a “chord sheet” that has only the lyrics and the chord symbols. Other questions? Contact Resound NW.